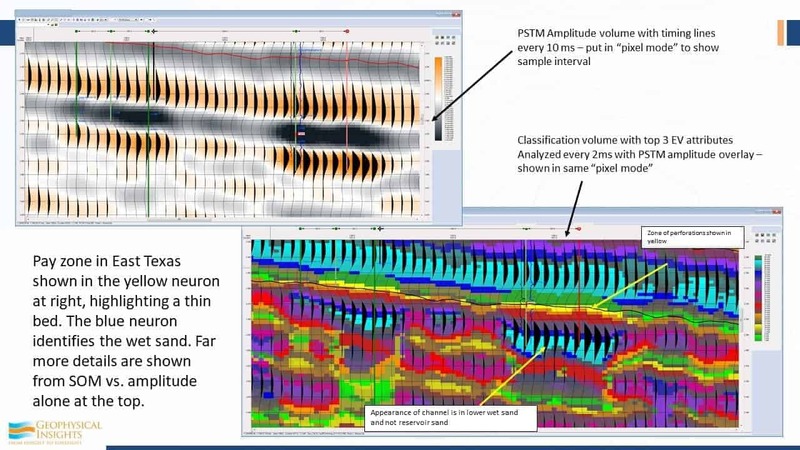 The research on this topic will investigate applications of new levels of seismic resolution afforded by multi-attribute Self-Organizing Maps (SOM), the unsupervised machine learning process in the Paradise software. The mathematical basis of detecting events below classical seismic tuning through simultaneous multi-attribute analysis – using machine learning – has been reported by Smith (2017) in an abstract submitted to SEG 2018. (Subsequently, the abstract has been placed online as a white paper resource). 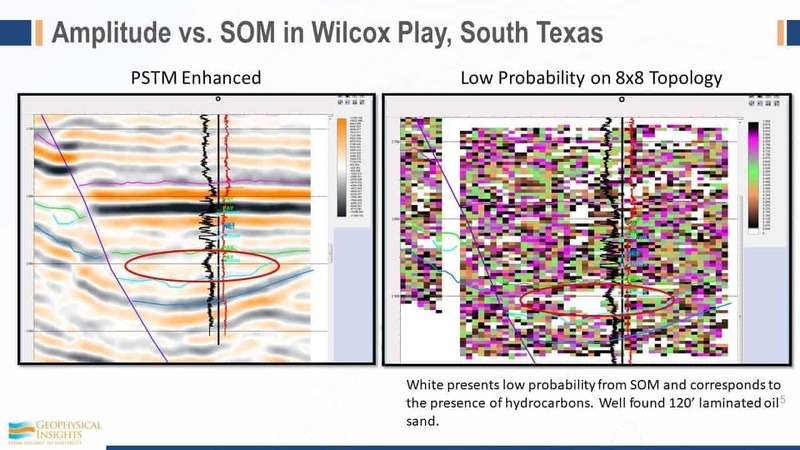 Examples of thin-bed resolution have been documented in a Frio onshore Texas reservoir, and in the Texas Eagle Ford Shale by Roden, et al., (2017). Therefore, the researcher is challenged to develop a better understanding of the physical basis for the resolution of events below seismic tuning vs. results from wavelet-based methods. Additional empirical results of the detection of thin beds are also welcomed. This approach has wide potential for both exploration and development in the interpretation of facies and stratigraphy and impact on reserve/resource calculations. 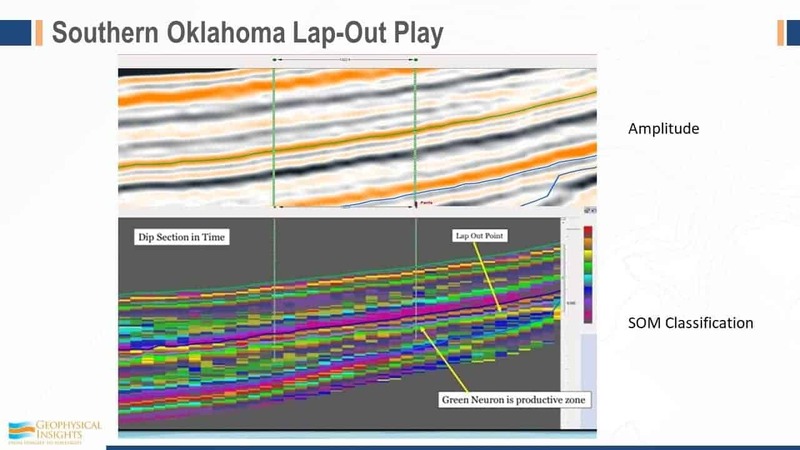 For unconventional plays, thin bed delineation will have a significant influence on directional drilling programs. The Paradise software has the capability of isolating and quantifying geobodies that result from a SOM machine learning process. Initial studies conducted with the technology suggest that the estimated reservoir volume is approximately what is being realized through the life of the field. This Challenge is to apply the geobody tool in Paradise along with other reservoir modeling techniques and field data to determine the effectiveness of geobodies in estimating reserves. If this proves to be correct, the estimating of reserves from geobodies could be done early in the lifecycle of the field, saving engineering time while reducing risk. A challenge to cluster-based classification techniques is corroborating well log curves to lithofacies. Up to this point, such corroboration has been an iterative process of running different neural configurations and visually comparing each classification result to “ground truth”. 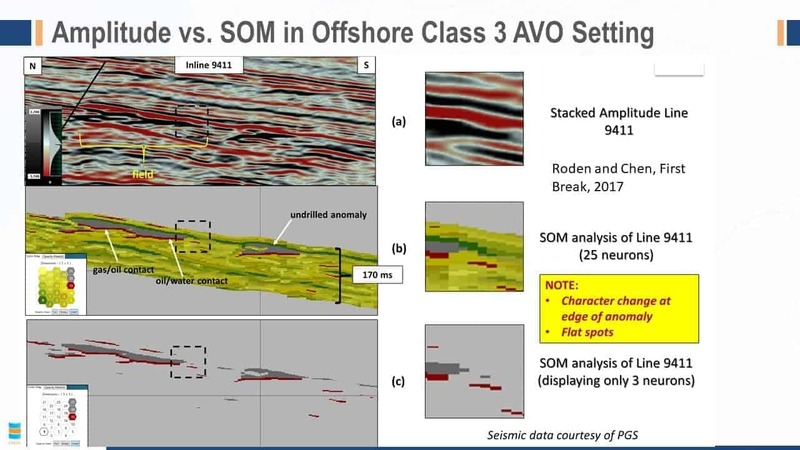 Some geoscientists (results yet to be published) have used bivariate statistical analysis from petrophysical well logs in combination with the SOM classification results to develop a representation of the static reservoir properties, including reservoir distribution and storage capacity. The challenge is to develop a methodology incorporating SOM seismic results with lithofacies determination from well logs. In addition to a standard classification volume resulting from a SOM analysis, Paradise also produces a “Probability” volume that is composed of a probability value at each voxel for a given neural class (neuron). This technique is a gauge of the consistency of a feature to the surrounding region. 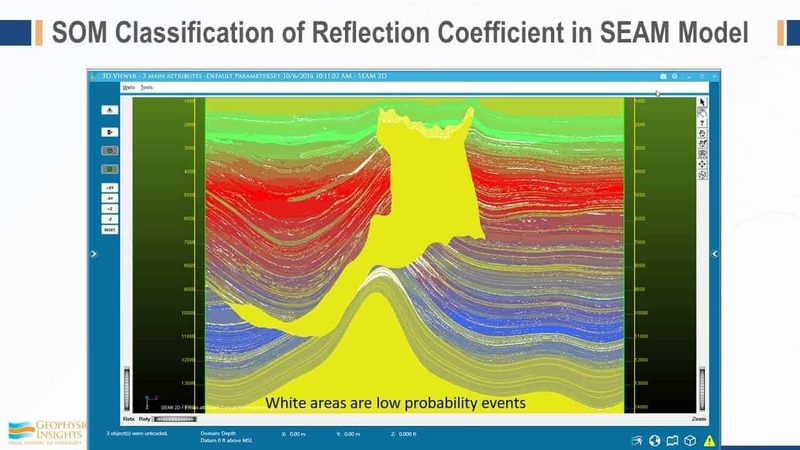 Direct Hydrocarbon Indicators (DHIs) tend to be identified in the Paradise software as “low probability” or “anomalous” events because their properties are often inconsistent with the region. These SOM low probability features have been documented by Roden et al. (2015) and Roden and Chen (2017). However, the Probability volume changes with the size of the region analyzed, and with respect to DHIs and anomalous features. This Challenge will determine the effectiveness of using the probability measure from a SOM result as a valid gauge of DHIs and set out the relationships among the optimum neural configuration, the size of the region, and extent of the DHIs. SOM results have proven to provide detailed information in the delineation and distribution of facies in essentially any geologic setting (Roden et al., 2015; Roden and Santogrossi, 2017; Santogrossi, 2017). Due to the high-resolution output of appropriate SOM analysis, individual facies units can often be defined in much more detail than conventional interpretation approaches. Research topics should be related to determining facies distribution in different geological environments utilizing the SOM process, available well log curves, and regional knowledge of stratigraphy. Risks and rewards are evenly poised in the hydrocarbons industry, and along with oil and gas companies, probably no one understands the nuances better than Tom Smith, founder and president of Geophysical Insights. In its first stage, the Houston-based software technology firm has developed a new technology based on unsupervised neural networks (UNN). Smith and his team are pioneering the application of UNN to the interpretation of 3-D seismic response data. Currently going to market as a service, the UNN technology has been applied successfully by medium-to-large capital energy companies. And looking ahead, Geophysical Insights plans to launch a full-scale commercial software product suite in 2012, which will be scaleable to fit the needs of small independents to oil and gas majors. The results are too obvious to ignore for any seismic data interpreter. With fossil fuels being a finite resource, time and money are of the essence for energy firms as they come under increasing pressure to make new discoveries. Be it Organization of Petroleum Exporting Countries (OPEC) or non-OPEC member states, with oil prices remaining north of US$80 per barrel, a buzzword in the industry is scouting and sniffing for new reserves. 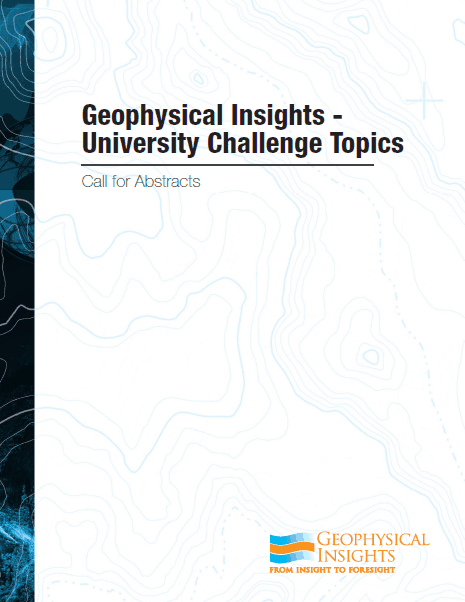 Undoubtedly for them, a major challenge they have to overcome is an insightful interpretation of seismic data. “This is an issue of yesterday, today and tomorrow. But with UNN there are certain advantages as the technology is focused on isolating the anomalies in any survey and presenting a clearer picture,” says Smith. According to him, the neural network becomes, in essence, a “learning machine” adapting to the characteristics of the data and resulting in what is called self-organizing maps. The input data are unclassified and the learning process is unattended. That is, no form of well log or reference data is required to calibrate the UNN at specific geographic locations. Upon completion of the learning process, the neurons will identify anomalies in the data—materials that are different than their surroundings because of the variations in the seismic attributes at those locations. This supports and facilitates the exploration process by identifying the shapes and sizes of anomalies, which then suggest locations deserving additional study. NEURAL NETWORK Geophysical Insights applies unsupervised neural networks to the interpretation of 3-D seismic data. The new volume of data created by the process identifies specific areas of interest within a survey. A neuron “learns” by adjusting its position within the attribute space as it is drawn toward nearby data points. The winning neuron is the one that is closest to the selected data point. The company’s current pricing model is based on the size of the appraisal area. It is currently analyzing acreages ranging from 50 to 800 square miles, both onshore and offshore. 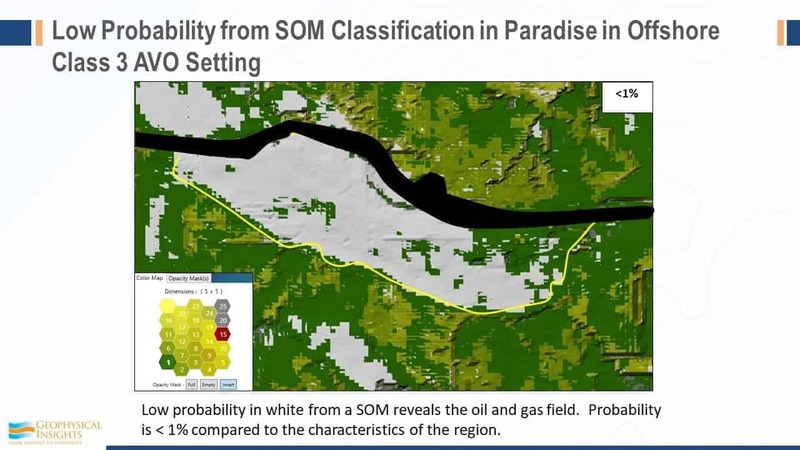 Green elaborated on the “service” offer for oil and gas companies, stating that a prospective client typically selects a geographical appraisal area that is captured in a single SEG-Y file (a file format developed by the Society of Exploration Geophysicists). “Without an initial investment on the part of the client, we perform an analysis on that entire region/file based on an initial set of 13 attributes using our technology. At that point, we request the client to identify a sample area representing not more than 10 per cent of the whole appraisal area,” he says. 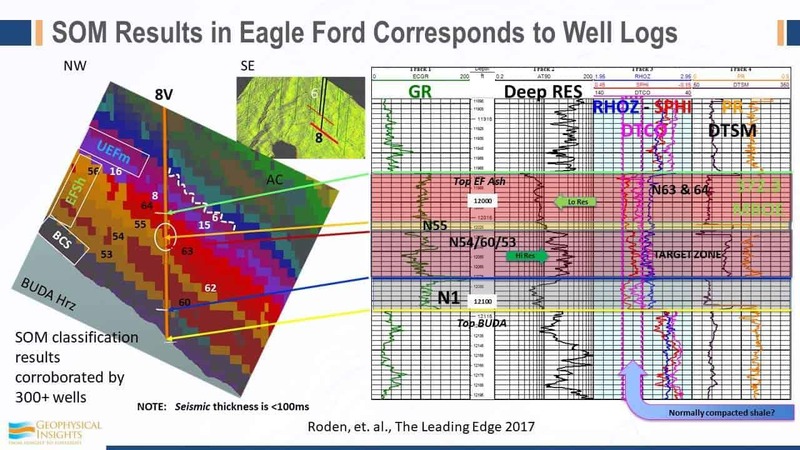 As a next step, Geophysical Insights then presents the detailed results/findings of the UNN analysis on the selected sample area and a summary of the findings across the whole appraisal area. If the client finds those results promising, they enter into a mutually acceptable technical and commercial relationship that provides the oil and gas company the complete details of the analysis across the entire appraisal area, including supporting conclusions in written form from Smith. Irrespective of what the price may be, Smith is sanguine about a growing future demand of the product. A growing shortage of geoscientists in the industry— primarily due to retirements— implies oil and gas companies will rely on the incremental use of technology to interpret seismic data and better understand the geology. “We see the use of UNN not just in seismic surveys, but also in downhole measurements, monitoring production processes and more,” he says. Despite its initial success, Geophysical Insights is not resting on its laurels and is pursuing efforts to scale new heights in game-changing, “disruptive” technologies. 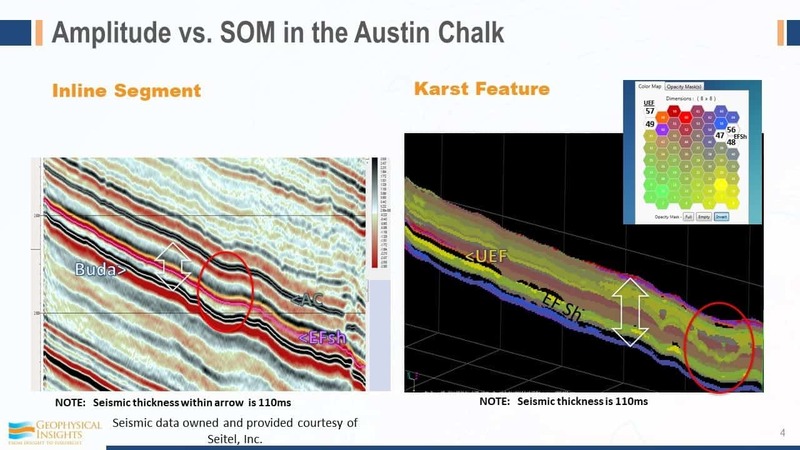 In a white paper presented early this year at an industry conference in Houston, Ken Cooley, a consultant to Geophysical Insights, highlighted the benefits of plans underway to implement their seismic data storage in the Professional Petroleum Data Management (PPDM) Association model. Calgary-based PPDM is a global, not-for-profit standards organization that works collaboratively with industry to create and publish data management standards for the petroleum industry. 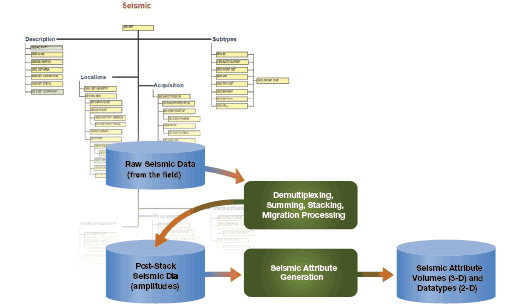 Cooley’s paper described a pattern of “populating” seismic survey meta-data to unambiguously store and access the data in a PPDM database through standard methods. The verdict will be much awaited, but in the meanwhile Smith has high expectations from UNN. Geophysical Insights’ seismic interpretation technology’s success lies in categorization and interpretation of all attributes of data—of which there may be six to 100— simultaneously. 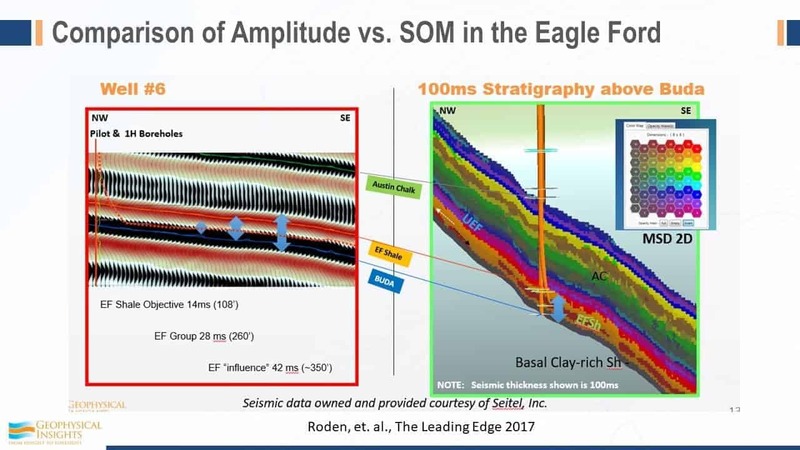 The company plans to implement its seismic data storage in the Professional Petroleum Data Management (PPDM) Association model. 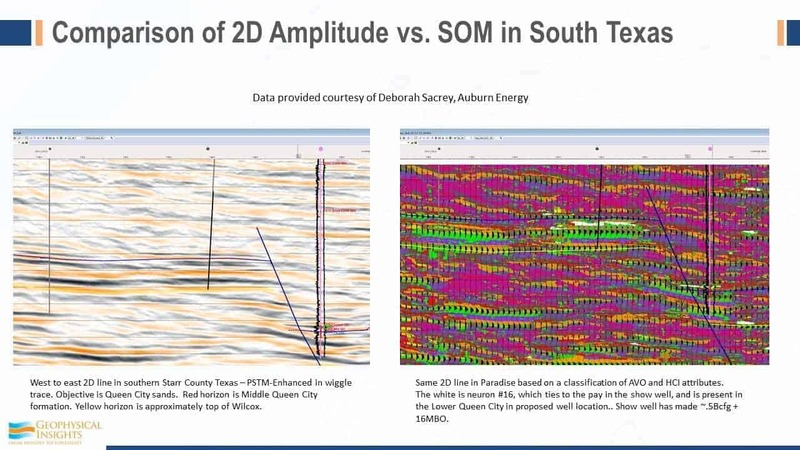 It has outlined a pattern of “populating” seismic survey meta-data to unambiguously store and access the data in a PPDM database through standard methods. Geophysical Insights applies unsupervised neural networks to the interpretation of 3-D seismic data. The new volume of data created by the process identifies specific areas of interest within a survey. A neuron “learns” by adjusting its position within the attribute space as it is drawn toward nearby data points. The winning neuron is the one that is closest to the selected data point.